The first recorded owner of this work, the Marchese Filippo Serlupi Crescenzi, was a wealthy lawyer and art collector who sheltered the great critic Bernard Berenson during the Nazi occupation of Florence in the final years of the Second World War . This relatively large and impressive gold ground depicts the Pietà, a scene that is not described in the Gospels. It is, however, a further dramatization of the connection that the Virgin Mary has with her Son and the despair that she suffered at his Crucifixion. Here, we see the Madonna seated on a ledge as the dead Christ is draped over her lap. She looks at Him with calm sadness and supports his neck with her own shawl, as she would a newborn child. His skin is a darker colour than His living mother, he is covered with drops of blood and his Stigmata wounds have a specific emphasis, all underlining the violence of His sacrifice. Andrea De Marchi, who is responsible for reconstructing this artist’s catalogue of works, has identified the artist of this picture as the Master of the Madonna del Parto, an artist in the circle of Niccolo di Pietrò and subsequently active in Venice at the end of the 14th Century. He specifically compares the present work to others by the Master of the Madonna del Parto including St. Francis and St. Ludovic in the Musée du Petit Palais, Avignon; St. Egidius and St. Claire, formerly in the Ciardiello collection; and the Madonna of Humility and the Pietà in the Pushkin Museum, Moscow. 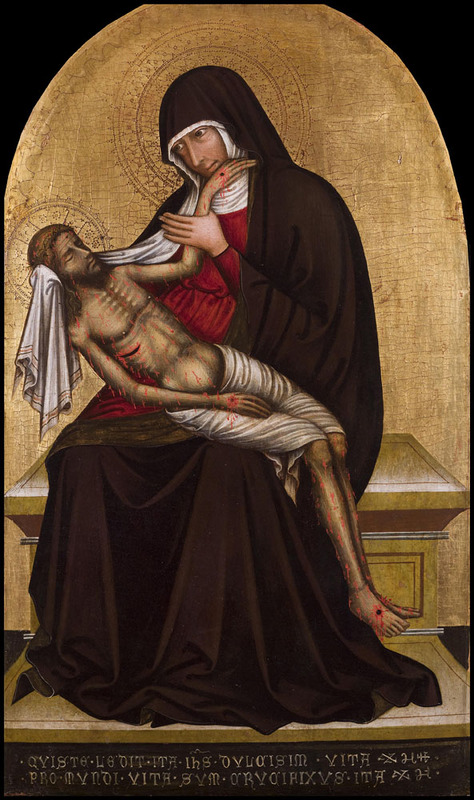 It is likely, based on stylistic comparisons, that this panel was executed around 1370.